On Wednesday evening last the 27th July Tipperary under 16s travelled to Edenderry to play Louth Ladies in this yearâs under 16 âBâ All Ireland Football final. Very little was known regarding this Louth side, who were appearing in their first final whereas Tipperary had previously won the competition on two occasions, 2009 & 2014 and been runners up twice in 2011 & 2012. Louth had qualified on merit after a strong Leinster campaign and had defeated Tyrone in the semi final by six points. Tipperary had won Munster after seeing off a strong Waterford challenge by four points before accounting for Roscommon in their semi final. For this final Tipperary would be without influential forward Clonmel Commercials Ava Fennessy. Tipperaryâs management team made some tactical moves directly from the throw in dropping Anna Rose Kennedy back in support of her defence and Angela McGuigan listed at number 13 playing a more outfield role. This appeared to unsettle the Louth side and McGuigan had Tippâs first score, a pointed free immediately. Louth replied with a nice point from Lauren Boyle but from here on Tipperary were the dominant side playing some lovely composed football and constantly on the attack. Lattin-Cullenâs Katie Cunningham was winning her inside forward battles and she put Tipp ahead in the 4th minute. There now followed an excellent passage of play with the defence moving the ball through midfielders Roisin Daly and Marie Creedon with half back Anna Carey continuing her run before firing home Tippâs first goal in the seventh minute. Try as they might Louth simply could not make inroads in a tight Tipperary defence where Anna Rose Kennedy, Niamh Martin & Caitlin Kennedy were impressive. Tipp midfielder, Creedon was mopping up too dropping back before passing lovely ball to her forward colleagues. Boherlahanâs Aine OâDwyer at number ten was a powerhouse travelling up and down her wing at pace. Louth did manage two points in reply to the Tipp goal but McGuigan and full forward Sarah Delaney cancelled these out within a minute. McGuigan was now on song and added two more before midfielder Creedon also travelled forward to kick a fine point herself in the fifteenth minute. Even at this early stage it was beginning to look as if Tipp were fast becoming the dominant team. In the seventeenth minute Katie Cunningham, having made a clever run and getting in behind the Louth defence fired home Tippâs second goal. This move was following a surge up the middle by Anna Rose Kennedy, Aine OâDwyer and Anna Carey. Full forward Delaney scored a point from the kick out and Tipperary were quickly getting out of sight. Louth introduced a double substitution in an effort to stem the side. They scored their fourth point in the twentieth minute but then had three wides mainly due to the pressure from the Tipp defence where Lucy Spillane and Emma Cronin were making great blocks on the Louth attackers. Delaney added Tippâs final first half score, a point in injury time to leave Tipp ahead at half time 3:10 to Louthâs :04. Louth began the second half in determined fashion and for the first five minutes had most of the possession but only managed a point from play and two wides during this dominance. Tipp had made a goal line clearance during this period which further frustrated Louth Ladies. Tippâs Ciara Halpin had replaced Katie Cunningham at half time and Tipp once more began to dominate and when full forward Sarah Delaney goaled again in the 5th minute the contest was as good as over. 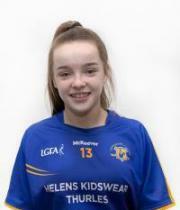 Fethardâs Lauren Dowling replaced her club mate Lucy Spillane on 12 minutes as Tipp began to use their talented bench. Muireann OâConnell (0:2) and a Niamh Martin point put Tipperary further ahead. Louth continued to press and were rewarded in the twenty-third minute with a fine goal from full forward Hannah Carolan. Cahirâs Christina Delaney replaced Aine OâDwyer who had given her all for the cause. The two teams now traded points but it was goals Louth now required. Another Tipp substitution saw Emma Ryan replace Angela McGuigan and Ellie Ryan on for Anna Carey. Louth finished the final minutes remaining with three unanswered points but by then Tipperary were too far ahead to be caught. When referee Jonathan Murphy blew the full time whistle Tipperary were worthy winners on a scoreline of 3:16 to 1:12. Following the presentation of the cup to winning captain Roisin Daly, the player of the match award was announced. For her strength, determination and consistency throughout the match Tipperaryâs midfielder Marie Creedon was announced as the recipient. Congratulations to manager Ed Burke and his backroom team of Peter Creedon, Tony Smith, Biddy Ryan, Trish McElwee and Physio Ollie Griffin. This was a team well prepared and knowing the game plan which they applied throughout the contest. The team played with a confident maturity making almost no errors throughout which is impressive in any underage team. With a good number of this team and panel still underage next year Tipperary look well placed to defend this title in 2017. Tipperary : Nicola OâDwyer, Lucy Spillane, Caitlin Kennedy, Emma Cronin, Niamh Martin (0:1), Rachel OâDonnell, Anna Carey (2:0), Roisin Daly Capt, Marie Creedon (0:1), Aine OâDwyer, Anna Rose Kennedy, Muireann OâConnell (0:2), Angela McGuigan (0:6), Sarah Delaney (0:5), Katie Cunningham ( 1:01). Tipperary âVâ Roscommon Under 16 âBâ All Ireland Semi Final. Banagher, Co Offaly Wednesday 13th July. Older readers will be familiar with the term âYou canât bate Banagherâ. Yesterday, Wednesday evening the Tipperary under 16 footballers travelled to Banagher in their attempt to beat Roscommon ladies team to earn a place in this year under 16 All Ireland final. This they achieved in with no little amount of skill and hard graft and football ability. Coming into the game we wondered how would the long layoff from competitive action impact on the team in general. Their last outing had been back in May in the Munster final after which followed a lengthy lay off for exams. We need not have worried as once the game began it was evident that this Tipperary team were determined to follow in their younger, under 14 county teams path and make the final. Tipperary won the toss and elected to play with a fresh breeze. Tipperary had the first attack forcing a Roscommon save which went out for a 45m kick. From this Tipperary earned a free and the accurate boot of Angela McGuigan put Tipp ahead in the 2nd minute. Roscommon were enjoying plenty possession but once they hit the Tipp half back line quickly found their options limited. Such was the Tipp ladies determination that Roscommon were forced into hurried kicking or misplaced passing. Tipp's first goal arrived in the 4th minute when lovely interplay between Aine OâDwyer, Anna Carey ended with the impressive Sarah Delaney at full forward finishing to the net. Less than three minutes later Anna Carey herself got through on goal and made no mistake. Both sides then had a number of missed chances but Tipp were on top in all areas of the field. Captain and midfielder Roisin Daly led by example and her work rate was outstanding. In defence or attack she carried ball effortlessly and was an inspiration to all around her. Roscommon had their first score from play in the twelfth minute but even at this early stage the writing was on the wall. This point was immediately cancelled out by a Daly point for Tipp. In fairness to the Roscommon ladies they continued to probe for openings and enjoyed their best spell in the next few minutes scoring another point and forcing Tipp keeper Nicola OâDwyer into a smart save at the expense of a 45m kick. Tippâs Ava Fennessy, fresh from her under 14 All Ireland success cracked a powerful shot off the Roscommon cross bar but made amends with a fine point from the kick out. Roscommon supporters got a lift in the twentieth minute when a long dropping ball aided by the artificial goalmouth surface took a mighty bounce and ended up in the Tipp goals. Roscommon 1:02 Tipperary 2:03. The Roscommon hearts were shattered almost immediately however when in the space of the next four minutes Tipperary scored two unanswered goals from center forward Angela McGuigan & full forward Sarah Delaney. Captain Roisin Daly added to the Tipp tally just before half time with another well taken point. A feature of this half had been the Tipperary ladies quality use of the ball when in possession. Passes found their targets and scores were well taken with players supporting throughout. Congratulations to manager Ed Burke and his backroom team of Peter Creedon, Tony Smith, Biddy Ryan, Trish McElwee and Physio Ollie Griffin. Tipperary : Nicola OâDwyer, Lucy Spillane, Caitlin Kennedy, Emma Cronin, Niamh Martin, Rachel OâDonnell, Anna Carey (1:0), Roisin Daly (Capt:(02), Marie Creedon, Aine OâDwyer, Ava Fennessy (1:01), Anna Rose Kennedy, Angela McGuigan (2:01), Sarah Delaney (2:0), Katie Cunningham ; Subs Used Muireann OâConnell, Caoimhe Ryan, Linda Murphy (1:0), Saoirse OâMeara. Panel : Saoirse Fanning, Lauren Dowling, Ciara Halpin, Laura Stocksborough, Caoimhe Comerford, Christina Delaney, Niamh Keane, Sadhbh Leahy, Niamh Ryan, Emma Ryan, Aine Hahessy.